Blue Thumb, headquartered in Saginaw, Mich., added to its Artisan Triple Fountain Series with the release of the White Grey Fountain ABART1600. 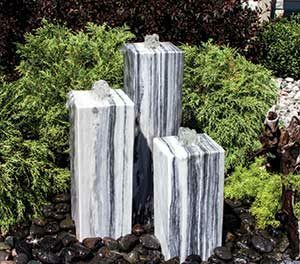 The fountain kit features three polished marble towers with heights of 18, 24 and 30 inches, respectively. The easy-to-install kit comes with an Achelous Basin Reservoir, a mag-drive pump that features a flow rate of 1,495 gallons per hour, a flow control valve, plumbing, tubing and 200 pounds of polished pebbles. Customers may choose pebble color from available stock. The fountain is one of 74 new stone and color designs the Blue Thumb has added to its Artisan Fountain Series.